In early 2008, my almost 5 year relationship with The Ex (finally) came to the halt it deserved. However, that left me stranded with a non-refundable plane ticket to Puerto Rico and a cruise booked for two to the Eastern Caribbean. Cue my good friend, Meghan, who jumped at the chance to pick up PR, USVI, Dutch & French St. Maarten, Antigua, St. Lucia, and Barbados with me! (No wonder I'm at 25 foreign countries/territories and counting!) We relaxed. We ate. We snorkeled. We toured. We ziplined with Roger. (Oh... Roger!) And it was one of my favorite vacations ever. 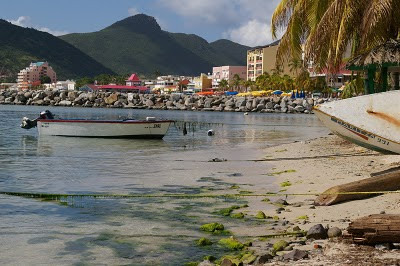 This picture was taken in Phillipsburg, St. Maarten, right off where the ferry dropped you after arriving into town from the ship. We were there in early November and with all the chaos at work right now, I'd pretty much give anything to be able to be THERE instead of HERE!